Asteroid Apophis-99942 could collide with earth in 2029 according to a Russian scientist. Could this happen and fulfill Wormwood of Revelation 8? An asteroid could collide with the Earth in 2029, a Sergey Smirnov, a senior researcher at the Pulkovo Space Observatory, told a press conference in Moscow on Thursday, Interfax news agency reports. On April 13, 2029 the asteroid Apophis-99942 will be at its closest distance to the Earth for 200 years, Smirnov said. The asteroid will pass the Earth at a distance of 30,000 to 40,000 km. “This crosses the geo-stationary orbit, where all the telecommunications and a lot of military satellites are,” he said. Whatever happens, the Earth will feel the effect of the asteroid, and in the worst case, it will collide with the Earth, and at best it will damage equipment in space in the geo-stationary orbit. Could this be Wormwood? I know that this would be rather late in the day regarding most eschatologists’ timelines. An actual ‘star’ as a ball of gas, however, stands to be an unlikely candidate except as an event in which similar nuclear fusion is involved. I would be very interested to hear your comment. I disagree that an actual ball-of-gas star cannot be what Wormwood is referring to, although I admit I've made that mistake of not accepting the plain sense meaning of "star" myself for years. 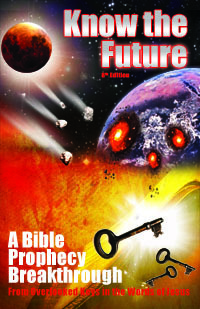 The word in Revelation 8 for star asteros is used to refer to planets, comets, and stars throughout the New Testament. However, unlike the falling object "like" a mountain burning with fire before crashing into the ocean at the second trumpet, careful reading shows that this star itself never collides with the earth yet still burns like a torch. In other words, its luminescence is not a byproduct of the earth's atmosphere but is inherent. This sure sounds like a star, a star that, unlike an asteroid, is big enough to explain all the other trumpet's cosmic impacts and disturbances before it (including the 6th seal that starts the sequence) as well as the shortening of the year to 360 days (and lunar month lengthened to 30 days) after it passes. So that disqualifies it right there for me. But you correctly raise the point that 2029 is pretty late in the end times timeline. In fact, I can disqualify this as Wormwood because the Bible timeline tells us that Wormwood comes right before the middle of the 70th week, which it also tells us is a Sabbath year cycle. What this does is allows us to rule out six out of every seven years as candidates for the arrival of Wormwood (and likewise the arrival of the rapture and Jesus Christ). Knowing the future Sabbath years from the historic Sabbath year cycles, I can say that 2029 is one year that scripturally Wormwood will absolutely not come. I expect the rogue planet Wormwood to arrive long before 2029 and Apophis. But people have been wrong on these issues before, so I take it seven years at a time..and 2029 is beyond that period that I know for sure about. See Know the Future for explanation of these arguments.